SATISFACTION WITH THE QUALITY OF CUSTOMER SERVICE , ELECTRIC MOTOR J&N MOTOR SERVICE CO.,LTD. FACTORS MAKETING INFLUENCING THE PURCHASE OF EDUCATIONAL MATERIALS IS THE FIELD OF SUKSAPAN PANIT RACHADAMNEONAVE. 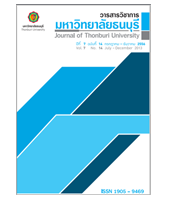 FACTORS INFLUENCING CONSUMERS’ BEHAVIOR OF ALCOHOLIC LIQUORS IN NONG KHAEM DISTRICT, BANGKOK.